I’m Claire, Director of Client Services. I lead the Global Client Services team consisting of passionate and brilliant individuals. We are responsible for the day-to-day account management and growing the partnership with top advertisers. I stumbled upon their online job posting after I left my job in a multinational advertising agency. I was new to the digital/mobile ad space and wanted to give it a try. Aarki has evolved a lot and continues to be ahead in the mobile ad tech industry. Providing an integrated app marketing solution to advertisers through a powerful DSP and creative studio. Programmatic spend will continue to increase and it will be both for user acquisition and re-engagement or remarketing to reactivate their lapsed users. Aarki Encore will be the strongest and most profitable programmatic mobile app marketing agency. There are so many. I’m proud when advertisers are satisfied with the results of their campaigns and how we’ve helped them meet their goals. We’re like a family with diverse personalities. I see young, driven, talented, amazing individuals. Always choose to be happy and grateful in any circumstances. I love Chicago. I enjoyed looking at the architecture and the skyscrapers. Aside from the fact that I have relatives living there, the famous "Garrett's Popcorn" and deep dish pizza make it the greatest city in the US for me. My family, coffee, hand sanitizer. I’m currently reading "Love and Gravity" by Samantha Sotto. It’s about a girl living in a modern-day San Francisco who falls in love with a young Isaac Newton. I’m a hopeless romantic so most of my books are love stories. I want to be a yogi so I can relax both my mind and body. See the future or time travel. I don’t want to be famous. I just want to be remembered as a loving, caring and inspiring person. Happiness is a choice and a mindset so I choose to be happy every day. Seeing my loved ones having fun and enjoying is when I’m happiest. 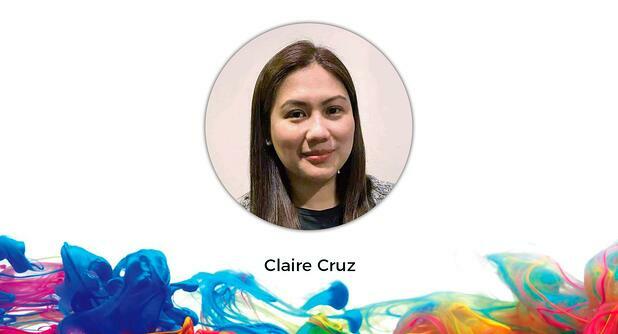 Claire has a Bachelor's Degree in Communication with the field of study in Public Relations, Advertising, and Applied Communication. Her strong negotiation skills and critical reasoning enable her to provide excellent client service and ensure her team does the same.